Climate change, social justice, and sustainable agriculture take center stage. Admit it: Obama is a cool president. He shares playlists on Twitter, he goes deadpan on Between Two Ferns, and now he’s having a house party — or a White House party, if you will. 6x9: A virtual reality exhibit on solitary confinement to demonstrate why the inhumane treatment should be banned. The viewer will experience the psychological impacts of long-term sensory deprivation such as blurred vision, hallucinations, and a sense of floating. Find Your Park Machine: A digital wayfinding sign that uses audio, visual, and geo-location elements to give guests the chance to experience all 400+ of America's national parks in just 60 seconds! Round Robots: A collaboration between Black Girls Code and Sphero gives visitors the opportunity to program and play with spherical robots. To-Do Note Installation: A sticky note installation where guests can write down their plans to make a positive impact in their community. This exhibit was created by Illegal Art group. - Musical performances by The Lumineers, Sharon Jones and the Dap Kings, and DJ Beverly Bond. - Panel discussions with industry leaders on some of society's most pressing topics. Topics include technology, sustainable agriculture, social justice, and how individual citizens can bring change to our country. -White House Student Film Fest: There will be screenings of three student films chosen from the 3rd Annual White House Student Film Festival. Students submitted more than 700 short films on the theme, "The world I want to live in." -DiCaprio will screen his climate change documentary Before The Flood. "If you do not believe in climate change, you do not believe in facts or in science or empirical truths, and therefore, in my humble opinion, you should not be allowed to hold public office." "We’re seeing climate changes at the more pessimistic end of the range that [was] anticipated by scientists. So we’re really in a race against time." 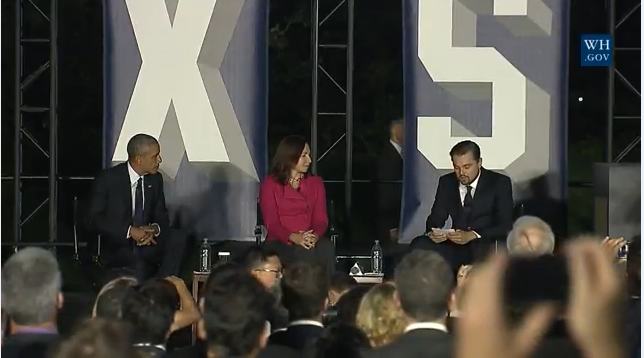 "SXSL: A White House festival of ideas, art, and action."